State environmental officials are preparing to ban hospitals, universities, hotels, large restaurants, and other big businesses and institutions in Massachusetts from discarding food waste in the trash beginning in 2014. The proposed ban, designed to save space in landfills and reduce emissions of gases that trap heat in the atmosphere, will make Massachusetts the first state with a comprehensive prohibition on commercial food waste. The state is currently on track to fall about a third behind its goal of cutting greenhouse gas emissions to 25 percent below 1990 levels by 2020 so their immediate goal is to divert a third of the nearly 1.4 million tons of organic waste produced every year in Massachusetts from landfills. Some business groups, however, have raised questions about the potential problems. If you choose to compost with your hauler, the ban will require a sophisticated transportation network and special containers and compactors to store the waste safely between pickups. 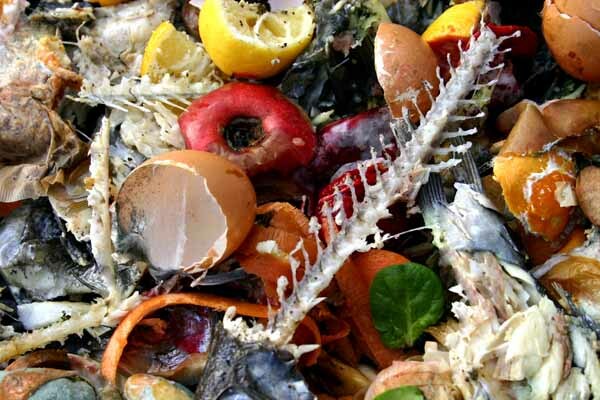 They worry that some restaurants and other businesses lack the space to keep the food waste on their lots, fear it could attract pests and rodents, and are concerned the cost for pickups would end up being more expensive than they are currently. Any additional expense can be a big issue for most, and food safety is non-negotiable. You can’t just have it hanging around. Massachusetts already has some of the highest solid waste disposal rates in the country – between $60 and $90 a ton. Those fees are expected to rise as landfill capacity declines. The state’s landfill capacity is expected to drop from about 2.1 million tons this year to about 600,000 tons in 2020, and given the difficulties of issuing permits for a new site, no new landfills are planned. Officials have not quantified how much eliminating organic waste in landfills would reduce greenhouse gases. But as an example of the fuel benefits, it has been noted that the state waste water treatment plant on Deer Island, saves about $15 million in fuel and nearly $3 million in electricity costs by converting sewage into energy. In Massachusetts, many universities, hospitals, and other institutions already divert their food waste from landfills utilizing the Eco-Safe Digester which transports the digested food waste to waste water treatment plants. Waste has incredible potential. If that potential can be harnessed in a way that doesn’t unleash pollution it can be transformative on a national scale. This entry was posted in Environmental Concerns and tagged Commercial Food Waste Diversion, Eco-Safe Digester Solution, Mass Ban on June 8, 2013 by BioHitech America.